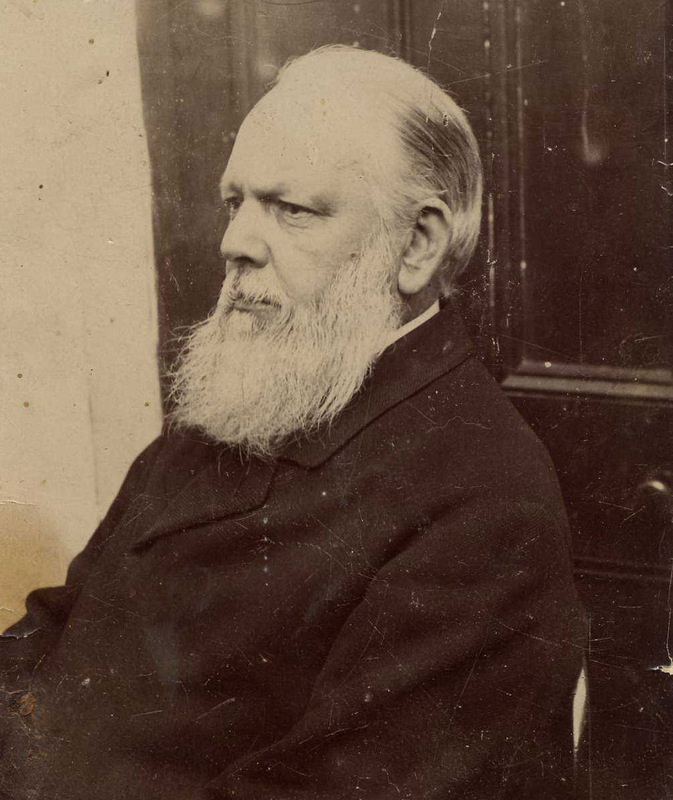 George Willis’ story was probably typical of several Victorian microphotograph makers. He was a professional portrait and landscape photographer, who expanded his product line to take advantage of the microphotograph fad on the late 1850s. At the time, Willis was based in York, England, where he probably enjoyed limited competition. To date, only one of Willis’ microphotographs is known to me, but it is numbered “20A”, implying a reasonable output of different pictures. During the early 1860s, Willis moved to Scarborough, Yorkshire, and formed a partnership with John Beckett. It is not known whether they also produced microphotographs. 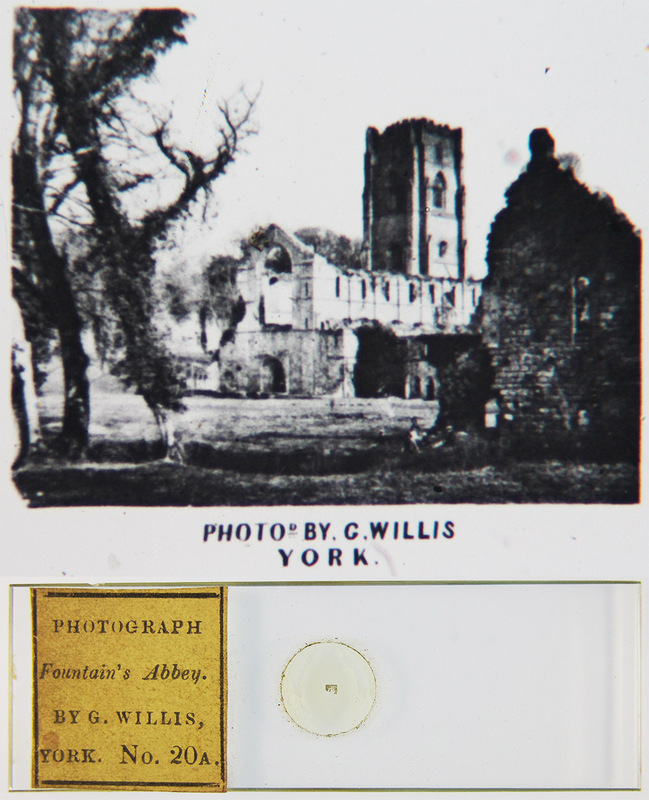 Willis appears to have begun work as a professional photographer in 1857, so his microphotograph slides can be dated to between that year and ca. 1863. Figure 1. Microphotograph 20A by George Willis, of the Fountains Abbey ruins. Produced ca. 1857 - 1863. George Willis was born on October 11, 1829, in Birmingham, the eldest of two children. His father, John, a “labourer”, died in 1838. George’s mother, Mary, remarried three years later, to John Smith, a “currier”. The 1851 census recorded George living in Birmingham with his mother and stepfather, sister, two step-siblings, and his maternal grandmother. He was then working as a “japanner”, i.e. he applied thick, black varnish to furniture and other objects. At a point during the next couple of years, George moved to York. There, he married Mary Ann Smith (not a close relation to his step-family), in 1854. According to a later advertisement, Willis began photographic studies in 1855 (Figure 2). That 1857 advertisement stated that he felt “confident that he is practically acquainted” with photography, and so probably marks the beginning of his professional photographic work. The 1857 Post Office Directory of York listed George as “photographic artist”. The 1861 census described him as “game dealer & photographer”. By May, 1863, Willis had moved to Scarborough, Yorkshire, and formed a partnership with John Beckett. The Willis microphotograph illustrated in Figure 1 bears his York address. From the above information, it can be dated between 1857 and ca. 1863. 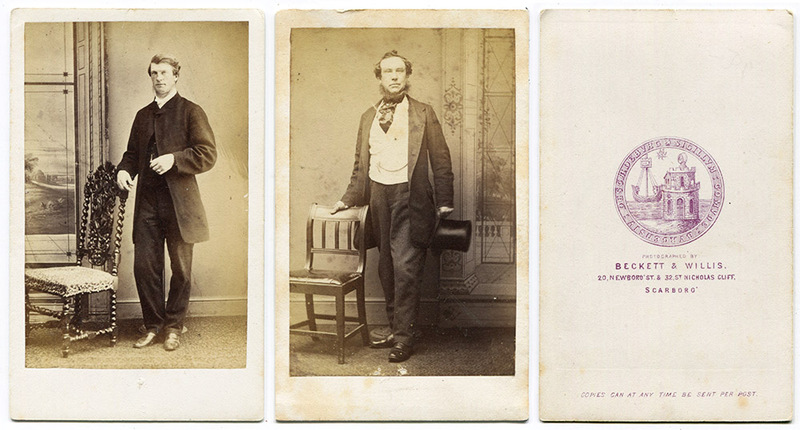 Willis and Beckett exhibited “photographic portraits and views” at the July, 1866 Yorkshire Fine Art & Industrial Exhibition. A March, 1867, letter from Willis indicated that he then was working alone. George Willis continued to work as a photographer for the remainder of his life. The 1871 census recorded his occupation as “landscape and portrait photographer”, and the 1890 Bulmer’s Directory listed him as “photographer”. He died during the summer of 1890. Figure 2. An 1857 advertisement from George Willis. He stated that “he has studied the above Art for the last Two Years, and feels confident that he is practically acquainted with it”. Figure 3. 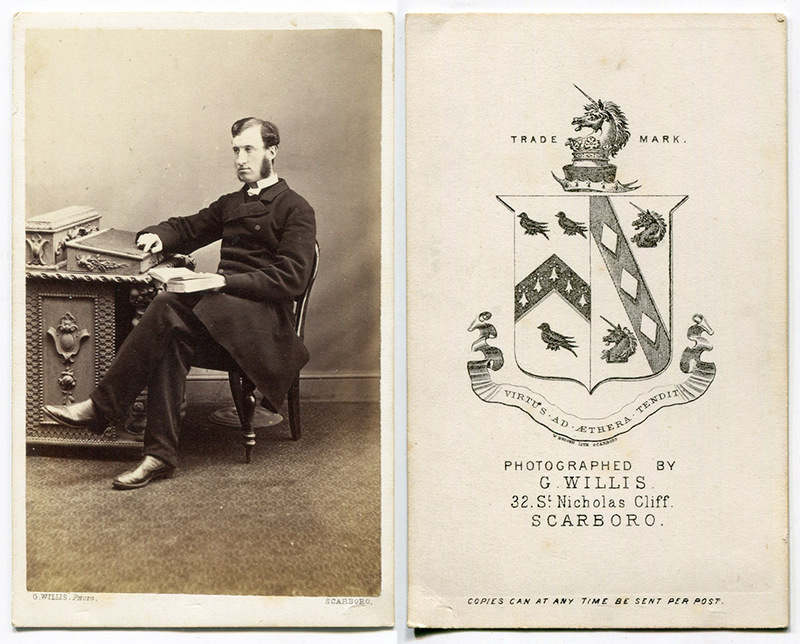 Willis moved to Scarborough, Yorkshire at a point between 1861 and 1863, and formed a photographic partnership with John Beckett. Two of their portrait cartes-de-visites (CDVs), and the reverse printing, are shown. Figure 4. Willis separated from Beckett ca. 1866. Figure 5. Two ca. 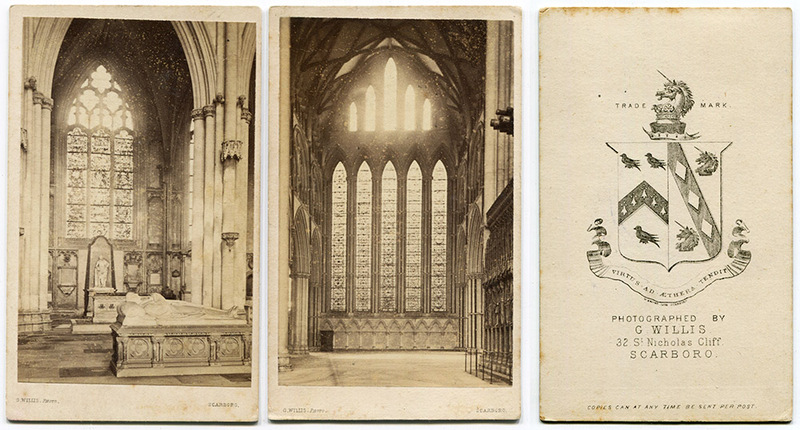 1870 CDVs by George Willis, of York Minster. These would have been sold as souvenirs. Figure 6. 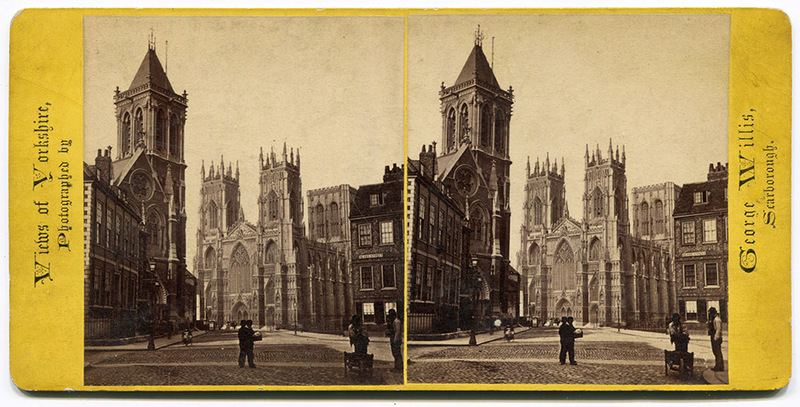 A stereoview of York Minster, by George Willis. Thank you to Richard Courtiour, for sharing images of Willis’ work.